I started this game thinking I’d just play a few games with my friends and move on. I never thought it would turn into what it has today — thanks mostly to the great community! Thanks so much for coming on this journey with me. I look forward to the next 10! Author FizzerPosted on February 28, 2018 7 Comments on 10 year anniversary! Warzone has just been updated to version 4.06.0! This update brings leaderboards to the Quickmatch system, as well as other fixes and improvements. The website and standalone versions are updated now. The Android app will be updated within an hour or so. iOS devices will not receive this update. – Quickmatch: Added leaderboards. 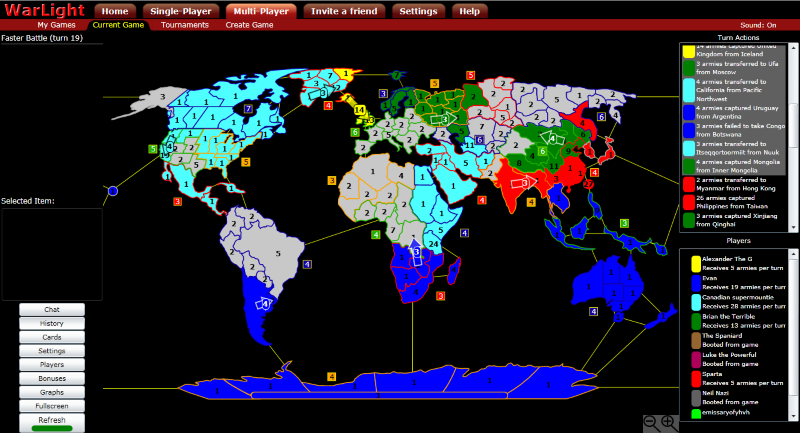 If your global rating is 200 or higher, you’ll now see a “Leaderboards” button appear in the Quickmatch page. – Quickmatch: Fixed duplicate “country” ratings. Thanks to Timiniator for reporting this. – Unity: If you issue an attack, then remove all of the armies from the source territory of that attack, then open the attack/transfer dialog again, the text box now defaults to “0” so that selecting Okay will now remove the attack without having to manually type a “0” into the box. – Unity: Fixed a bug that made changing perspectives in history give an error. – All: The “Retrieve older messages” button no longer appears on games without any chat. – All: Updated loading images. – Website: Improved the tooltips on the Points page. Thanks to EFHIII for reporting this. – Website: Updated Press page. – Android/iOS: Fixed a bug that could cause parts of a chat message you’re typing to be lost when using the “enter” key on the software keyboard. Thanks to MGO for reporting this. Warzone has just been updated to version 4.05.1! This update fixes some bugs, and makes some improvements throughout the app. Basically, this update contains all the fixes and improvements that were reported to me while I was working on UJS over the last month. The website and standalone versions are updated now. The Android app will be updated within a day or two, and the iOS app will be updated within a week or two. – All: Clicking “modify orders” while a game is past or very near the boot timer will now present a confirmation message, ensuring you actually want to do this and risk getting booted. – Quickmatch: When creating a 1v1 between two players with multiple templates checked, some random variance is now applied when deciding the template, instead of just picking the one with the most similar rating. This creates more template variety between players who play often. – Quickmatch: Fixed a bug with memberships expiring that could make templates un-changable. – Unity: Reduced memory usage. This should fix the “Your device has run out of memory” error that some people were getting. – Unity: Updated Unity version from 2017.2 to 2017.3. – Unity: Updated layout of Quickmatch page. – Unity: The map browser now has a checkbox “Hide locked maps” that can be used to hide or show maps you haven’t unlocked yet. – Unity: The store now always shows coin prices, instead of only showing coin prices if you could afford it. – Unity: Fixed a bug that could make the map unnecessarily zoom in if an animation played near the edge of the screen. – Unity: Fixed “1 army per turn per turn” text. Thanks to saftschachtel for reporting this. – Unity: Fixed several bugs that could cause errors when entering numbers greater than 2 billion into number fields. – Unity: Fixed a bug that allowed the settings panel to allow opening multiple mini profile dialogs. Thanks to EFHIII for reporting this. – Website: The WebGL app should load faster on repeated loads now. In Firefox, my computer can refresh the WebGL app in less than 5 seconds. Chrome is still much slower, so I still recommend using Firefox. – Website: Updated a few pages to be more mobile-friendly, most notably the Map page. – Website: Added receive card dialog setting to account settings page. – Website: Fixed a bug that caused some players to get an error message when accessing quickmatch through the website. – Website: Fixed a bug that made the radio buttons unclickable on the Create Custom Coin Game page. Thanks to MaikMcJuggle for reporting this. – Website: Fixed the tournament links on a mobile device. Thanks to Derfellios for reporting this. – Website: Fixed a bug that made the blacklist not work in Unity WebGL in some circumstances. Thanks to neal for reporting this. – Website: Fixed a bug that could cause an error in Microsoft Edge when using the arrow keys to navigate between All/RealTime/MultiDay buttons. Thanks to Otto von Bismarck for reporting this. – Flash: Fixed a bug with the redirect-to-unity prompt that appears when trying to open a Unity-only game. Update 4.05: Quickmatch now available through the website! Warzone has just been updated to version 4.05.0! This update brings the features of Quickmatch, which was previously only usable through the Unity client, to the website! This means that if you play Warzone through the website in Flash mode, you’ll now have access to Quickmatch. 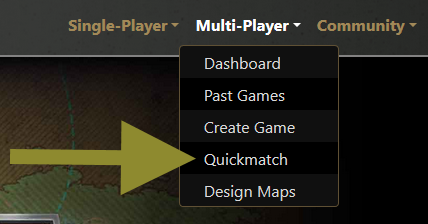 If you aren’t familiar with Quickmatch, it makes joining multi-player games significantly easier. Instead of having to scroll through a list of open games, joining a game is as easy as clicking one button. It can be used to join both real-time or multi-day games, while still giving you control over what templates you’re willing to play. See the original announcement for more details. Quickmatch was brought to the website through a new tool I’ve been developing called UJS. UJS’s goal is to bring the entire Warzone Unity app to the website, in a way that isn’t as slow a memory intensive as the currently available method. The main goal of developing UJS is in response to how slowly the Unity app loads on the website. In my opinion, it’s loading speed and memory usage are unacceptable, and I’m working on fixing that. Therefore, the magic of today’s update really has nothing to do with Quickmatch. This is a demonstration that the Unity app can run on the website and be quick, even on low-end computers. If this project is successful, the other pages from the Unity app will be run through UJS too. More details about this will be released in the future. Author FizzerPosted on February 3, 2018 5 Comments on Update 4.05: Quickmatch now available through the website!